Happy New Years! I wish all of you a potful of good luck, prosperity and happiness in the coming year! I always hedge the monetary odds by eating a dish of Hoppin’ John, a black-eyed pea dish typically served in the south on New Year’s Day. Earliest memory recalls my tiny fingers plucking out the peas, leaving behind the peppers: “Peas for pennies,” my dad would laugh, handing me a real penny, driving home his point. Not only do I insist my immediate family eat at least one bite of this regional specialty, I also hand-deliver a small tupperware container of the pea salad, festooned with a ribbon, to my neighbors. There are many variations on Hop ‘n John. 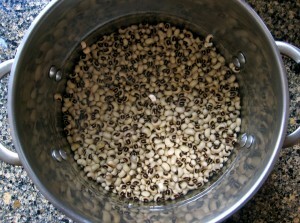 Field peas or Sea Island Red Peas, for instance, are sometimes substituted for black-eyed peas in Alabama, South Carolina and Georgia, and the peas are often cooked with a ham hock for added flavor. I generally toss my peas with chopped fried bacon for a smokey flavor and use the bacon fat to sauté the onion and celery. Many folks cook the peppers with the peas, but I prefer the bright color, crisp texture and fresh flavor of uncooked peppers. Chopped tomatoes are also a typical addition to Hop ‘n John. There is an art to cooking dry beans and the main ingredient is time. Not active time on the cook’s part, but time, nevertheless: time to soak, time to cook and time to allow the beans to sit in their cooking liquid absorbing all of those savory flavors. Past years I’ve saved time by substituting frozen black eyed peas for dried, but this year, all I have is time. On New Year’s Day, I double my chance for fortune by serving Hoppin’ John with a side of turnip greens or collards, the greens are said to symbolize dollar bills. I imagine there will be quite a run on peas and greens this year at the neighborhood markets, especially in this economy! Growing up we called black-eyed peas paired with greens, “Half and Half”. This must be a regional Alabama specialty, as a web search only provides links to the the dairy product. 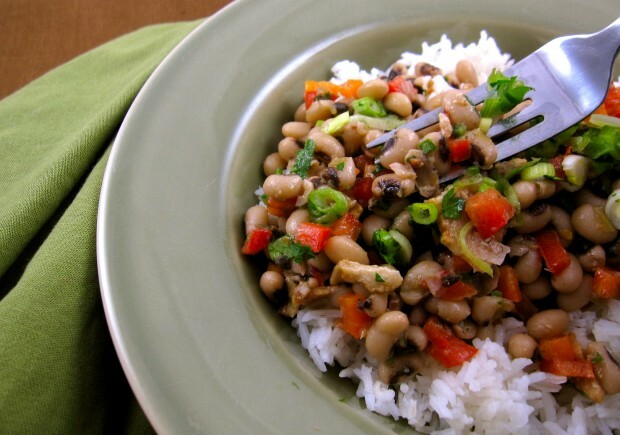 I enjoy Hoppin’ John liberally doused with pepper vinegar; the tangy heat of the vinegar is a delicious foil for the smoky, creaminess of the beans. If you can’t find pepper vinegar, you may improvise by tossing the cooked beans with chopped hot peppers and additional cider vinegar. I also enjoy the contrast of simply prepared long-grained rice with the spicy dish. Make a double-batch to insure you have leftover Hoppin’ John, which is then referred to as “Skippin’ Jenny” the next day. Eating leftover beans demonstrates frugality to the good-luck God’s, insuring them you are sincere and deserving of prosperity. Best served with an heirloom rice, such as Carolina Gold. Rinse dry peas, picking out and discarding cracked or yellowed. Soak 6-8 hours, refrigerated, in 8 cups cold water. In a large cast iron skillet or sauté pan, fry bacon until crispy, reserving fat. Drain on paper towels and reserve. Transfer bacon fat to a large pot. Over medium heat, sauté onion and celery in fat 3-4 minutes, or until just tender and fragrant. Add soaked peas, 6 cups of water and bay leaf to pot, with a pinch of sugar, if using. Bring to a boil, then reduce heat to a simmer and cook, with lid slightly ajar, until peas are almost tender, 45-75 minutes, depending on heat and pea used. Turn off heat, cover pot, and let peas sit in cooking liquid 1-2 hours until tender and creamy, but not overly soft and mushy. Drain. Whisk together oil and vinegar. Discard bay leaf from peas and toss peas with cider vinaigrette, peppers, scallions and reserved bacon. Season to taste with kosher salt, freshly ground pepper and pepper vinegar. If desired, add a pinch of additional sugar, to balance the acidity. *If not available in your area, season peas with 2-4 tablespoons finely chopped hot pepper, such as jalapeno, and 2-4 tablespoons cider vinegar. the most cost-effective price and it makes your body bigger. According to the obvious lack of it or get people looking young.